A hydraulic puller is an essential piece of equipment for a variety of different sectors. From construction, to mechanics and manufacture, a hydraulic bearing puller, or hydraulic gear puller, can provide the easy removal of parts that have been press-fitted – in particular gears and bearings. These tasks need to be completed with the utmost care and professionalism, which is why one of the hydraulic puller kits from SGS are the ideal choice. We have a variety of hydraulic gear pullers and hydraulic bearing pullers that can more than fit the bill for an affordable price. Our range can also be used for a number of other applications, as the hydraulic cylinder found on our pullers can easily be detached. This level of versatility can be highly beneficial to your work – particularly if you’re working for trade or other business purposes. So don’t choose other second-rate hydraulic bearing puller suppliers, choose only the best from SGS. Take a look at our selection of fantastic hydraulic puller sets below and purchase the ones you need today. 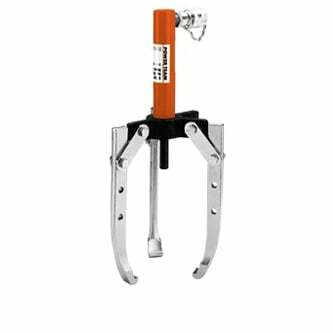 5 Ton PH53C 2/3 jaw puller set. Includes 1057 puller, RPS55 hydraulic set (C55C cylinder, P12 700 bar hand pump, fittings, coupler, and 1,8 m hose), and 309874 pushing adapter. 5 Ton PH53CR 2/3 jaw puller set. Includes 1057 puller, C55C cylinder, and 309874 pushing adapter. Pushing Adaptor 309875 22.2 mm diameter pushing adapter. Puller Head 47997 2-way/3-way puller head. (Can be used to convert No. 1038 7 ton manual puller into a 5 ton hydraulic puller. 10 Ton PH103C 2/3 jaw puller. Set includes 1060 puller, RPS1010 cylinder and pump set, 202179 threaded adapter, and 34602 pushing adapter. 17½ Ton PH172 2-jaw puller with RT172 centre-hole Power-Twin® cylinder, cylinder half coupler, P55 pump, 1.8 m hose, hose half coupler, 1"– 8 x 508 mm long adjusting screw, and adjusting crank. 17½ Ton PH173 Same as PH172 but with a 3 jaw puller. 17½ Ton PH173R 3-jaw puller with screw and crank, and RT172 center-hole twin cylinder. 30 Ton PH303 3-jaw puller with RT302 center-hole Power-Twin® cylinder, cylinder half coupler, P55 pump, 1.8 m hose, hose half coupler, 11/4"– 7 x 610 mm lg. adjusting screw, and adjusting crank. 30 Ton PH303R 3-jaw puller with screw and crank, and RT302 center-hole twin cylinder. 50 Ton PH503 3-jaw puller with RT503 center-hole Power-Twin® cylinder, cylinder half coupler, P55 pump, 1.8 m hose, hose half coupler, 15/8"– 51/2 x 772 mm long adjusting screw, and adjusting crank. Cylinder and pump set, hose, coupler not included. ** This puller may be used with any 10 ton single-acting cylinder having a 21/4"–14 straight collar thread. As well as receiving a quality and reliable product, with any purchase on our hydraulic puller range, you can enjoy additional benefits. Remember you can also get in touch with the SGS team today if you have any queries on our hydraulic gear pullers or kits, or if you need some buying advice on which product best suits your requirements. Our staff will be more than happy to help you find the right match from our range.